Remember Robot Wars from back in the day? Actually, there were a few—the 1994 U.S. series in San Francisco, a British game show first broadcast on BBC in 1998, and then a Nickelodeon version featuring kids driving the robots in 2002. All of these shows gave rise to SyFy’s Robot Combat League (which features humanoid, mecha-ish robots, and is by far the weakest of them all). Anyway, robots have been fighting each other for human entertainment for a while now, but unless Robot Combat League gets another season, there’s a dearth of these shows available at the moment. But all that’s about to change—RoboGames is coming to a computer near you. 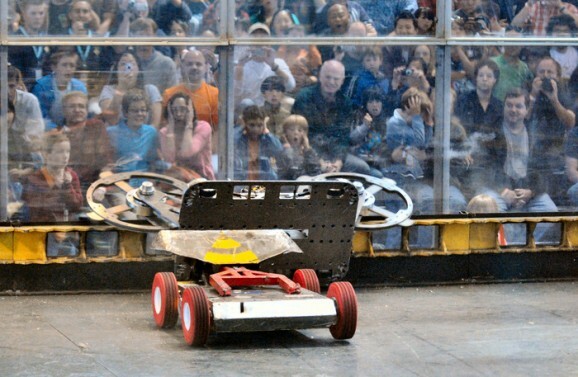 RoboGames, created by the Robotics Society of America in 2004, bills itself as the “Olympics of Robots.” Competitors from all over the world compete in over 50 different robot fighting events, including Kung-Fu, Lego robots (including Lego bowling! ), bartending, painting, and weight lifting—basically, if it’s something a robot can do, it’s an event. The games are held every year, and have aired on the Science Channel and on Discovery, but thanks to a successful Kickstarter, we’ll soon have access to a bunch of new mech combat, this time, in the form of a new independent web series. The current Kickstarter aims to recruit new international talent, as well as broadcast the games in high-def. Now that the campaign has met its $40,000 goal, it’s trying to meet the $48,000 stretch goal to guarantee that a lower resolution version of the series is available on YouTube. If that sounds awesome to you, you’ve got just over two days left to donate. The rewards are pretty cool, especially for large pledges. The highest prize includes being able to drive a 220-pound combat robot in a competition. I love the range of games in this competition, especially because a lot of them are skills-based, rather than straight-up combat. Let’s hope all this robot combat training doesn’t come back to bite us.